Hyderabad, listen up! These milkshakes are going to bring you to the yard and you’re going to love them all. From Mango cheesecake milkshake to Kit Kat shake, here’s where to find them. Oh, the number of hours we have spent at this cafe, either with our squad or just by ourself reading books in fine weather! This is one of the favourite hangout spots for city folk and we truly think that the milkshakes here are under-rated. Although the fruity shakes made out of seasonal variants like chikoo, muskmelon, and strawberry are creamy with fruit chunks, it’s the chocolate shakes that are worth drooling over. They have eight different types of chocolate shakes and we’re absolutely loving our gooey chocolate brownie cake. Concu often has dessert of the season, and in Summer, they had a delightful mango cheesecake milkshake that has an amazing texture and an even better taste (We totally fell in love!). Served in a Pinterest worthy glass bottles with a straw, this dessert was definitely a massive hit. In addition to this, the ever so luscious chocolate milkshake here is to die for. Their other two flavours like Madagascar Vanilla, Rosa, and Matcha too are to be devoured for they come blended with home-made gelato too. Tabula Rasa has a small but impressive dessert and shakes menu. 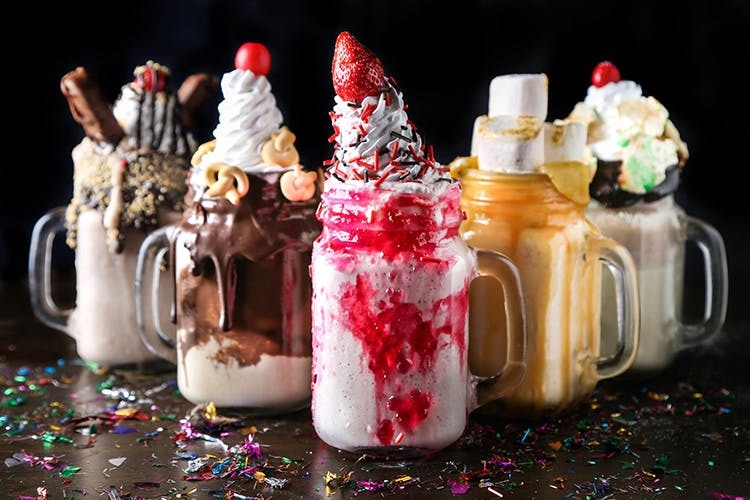 Amongst those are classic milkshakes and freakshakes, and they’ve totally got us freaking hyped. Be it a red velvet freakshake or an Oreo freakshake, your taste buds are gonna get shook! They also have unique flavours in their classics like Banana Berry Shake and Mango Honey Shake that will make you want to come back for more. Meet over a milkshake at any of the 10 Tempteys outlets in Hyderabad, and relish on their glorious shakes. For the fitness enthusiast in you, they have healthy options like Green Tea Mania, Ola Granola and Carrot & Cucumber Shake too. Coffee lovers, they know you might enjoy an occasional milkshake so they have options like Coffee Caramel which is a perfect blend of coffee, caramel and ice cream topped with whipped cream (yum, yum). Also, try out their premium and exclusive shakes with options like Naughty Nutella and Bubble Gum. Most of these milkshakes come in mason jars and will make your Instagram feed a tad bit colourful too. Also, for a fun activity with friends or bae, you can build your own milkshakes here. You’re missing out if you haven’t tried the all natural smoothies and coolers that come in cutesy jars at this beautiful cafe. But, the milkshakes here deserve some limelight too as they are equally good (if not better), and there are seven flavours. We recommend that you move over the coffee here and try the pancake shake or the peanut and banana milkshake instead and thank us later. With eight outlets in Hyderabad, Keventers has a variety like no other. They have thick shakes, classic shakes and fruity shakes served in old-fashioned bottles that we love! Their Alphonso Mango shake is something you cannot ignore, and while you’re at it — try the popcorn served in fashionable packed boxes too.